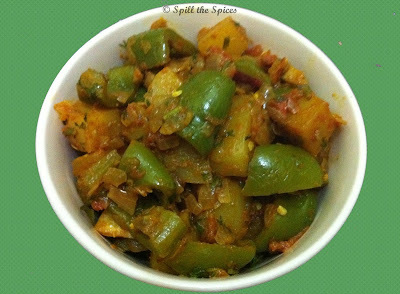 A simple and quick, mildly spiced curry with capsicum and potato that can served with chapathi and rice. 1. Heat oil. Add jeera, fennel seeds, ajwain and red chillies. When jeera pops, add onions. Fry till the onions become translucent. Now add ginger-garlic paste and fry till the onions turn golden. 2. Add tomatoes, potatoes, salt and turmeric powder. Mix well. Close and cook for 10 minutes, stirring once in between. 3. Then add jeera powder, coriander powder, red chilly powder and 1/2 cup water. Mix well and cook till potatoes become soft. 4. Add the capsicum and mix well. Cover and cook for another 5 minutes. Add garam masala, mix well and fry for 4-5 minutes. Garnish with coriander leaves. Simple and our family favorite. thanks for sending over to our event..
Really it is very nice i am also tying this one taste is simply super.